Chimneys in Mild Steel (MS) construction for Boiler and Diesel Generator exhaust. 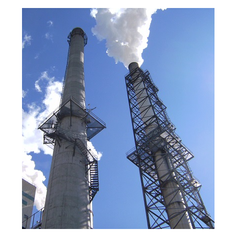 We design, fabricate and erect large chimneys for industrial applications. 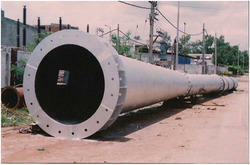 We are indulged in offering Steel Chimneys to our clients. We undertake installation of Steel Chimneys. In past we has handled chimneys ranging from 12 meters to 65 meters. These can be availed at market leading rates. By efficiently utilizing our high-capacity machines, we are able to manufacturer and supplier superior-grade Steel Chimney. Driven by a vision to achieve significant growth in the industry, we are engaged in providing a wide range of Industrial Steel Chimney. In order to retain our goodwill in this industry, we are providing a qualitative array of Steel Chimney. We offer quality Stainless Steel Kitchen Chimneys. - Suction Capacity: Non magnetic stainless steel. Industrial Chimney lined inside standard bottom cone self supporting which is made of high quality of sufficient thickness ms with ladder flat form, safety ring, earthling, sampling port, lightning arrested, erecting and heat weather resist painting. Erecting will be carried at costumer place by professionals by using heavy duty crane under the supervision of engineers.